Navigate: Browse Our Films / Gender & Culture / Gender Identity, Sexual Orientation & Culture / It Takes a Team! 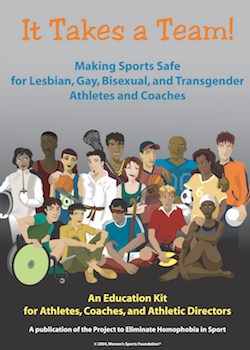 This educational "kit" -- which includes a 15-minute video, an informational poster, and colorful "Safe Space" stickers -- is intended to help coaches/teachers, parents, and school administrators educate students/athletes about the harmful effects of homophobia and asks the question, "How can we make sure that people in athletics are evaluated, not based on their sexual orientation or gender expression, but on their individual character and accomplishments?" The Project to Eliminate Homophobia in Sport is a collaborative effort of seven national organizations committed to the mission: To eliminate homophobia in sport and create an educated public that respects all athletes and sports-affiliated personnel regardless of sexual orientation and gender identity/expression. "Athletic spaces have and continue to be, in large part, intensely homophobic. The film begins with this point as high school and college athletes provide testimonials about the homophobia they have faced on courts and fields. Gay and lesbian players detail their experiences and decisions to come out or remain in the closet. Rather than characterizing all athletic spaces as homophobic and leaving it at that, It Takes a Team! explores different scenarios, from a high school football player who comes out and is welcomed by teammates to a female basketball player whose peers ostracize her for disclosing her identity. These nuanced responses are instructive as they assist students, especially those who identify as straight, in understanding the powerful implications of being an ally of or an adversary to a LGBTQ teammate. Also helpful to students are the ways in which the film conveys the different contexts and assumptions that swirl within men’s versus women’s sports in relation to LGBTQ issues. In addition, what is underscored through the voices of student-athletes in the film is that LGBTQ identity intersects with other subjectivities, including ethnicity and gender. A handful of student-athletes speak eloquently to this point and in doing so erase persistent myths of a monolithic LGBTQ culture. It Takes a Team! reminds us of the homophobia that remains in athletics, but it also underscores the enormous potential in making sport an open and inclusive space for all."